Your athlete is preparing for a big race and you want to be sure they are dialed in, peaked, rested, and ready to crush it. You’ve been focusing on their workout plan and the training seems to be going well. That’s great, but, all too often, what many coaches tend to ignore (or at least place less emphasis on) is their athlete’s body composition, everyday nutrition, pre-workout nutrition, in-training fuel and hydration, and post-workout recovery nutrition. A large majority of coaches are not experts in this arena and that’s OK, but what is not OK is ignoring or placing minimal emphasis in these areas (more on this later). Our goal as coaches should be to help assist our athletes and set them up for the absolute best success possible; therefore, placing laser-like focus on our athletes’ training and nutrition is imperative. It’s time to dial in the one-two punch. Some athletes can be extremely motivated, and that is a coach’s dream. These super-motivated athletes typically want to complete more workouts and want to go even harder than you have prescribed. As coaches, we embrace this energy and enthusiasm that these athletes possess, but remember you were hired for a reason: to be their coach, not their cheerleader. You are preparing your athlete for the big race, and you have their best interests in mind. You need to take control in the critical phase of the training cycle before a big race. Yes, coaching takes a ton more time, effort, and energy than cheerleading. Reinforce that the prescribed training, including heart rate, power, pace, speed, reps, strength training, etc. is dialed in for their specific needs and goals. It is important to encourage the athlete to use all of their energy to focus on what is on the schedule as opposed to what is not on the schedule (more workouts, harder workouts, etc.). As coaches, we push our athletes hard. The bigger the athlete’s goal, the bigger the commitment from the athlete and the more we are going to try to stretch the athlete’s comfort zone. But, we also should understand the power of rest, repair, and recovery. As mentioned above though, the super-motivated athlete will oftentimes view a rest day as an opportunity for an easy swim or an easy run instead of actual rest. Once again, as coaches, we need to take control. While it’s easy to appreciate the athlete’s drive and desire to do work on a scheduled rest day, it’s critical that we reinforce the huge benefits of rest and how it will make the next day’s workout that much more productive. Keep in mind, we are preparing our athlete for their big A-race, and we are prescribing the best work-to-rest ratio in order to achieve mega-success. My ninth grade English teacher and football coach would tell us that “there are two types of people in this world: those that know the answer and those that know where to find the answer.” In order to set our athletes up for success, we must become both of these individuals. Endurance coaches can learn a lot from the MMA (Mixed Martial Arts) world. For example, an MMA athlete has a striking coach, wrestling coach, Jiu Jitsu coach, nutrition coach, strength and conditioning coach, etc. The athlete is surrounded by an incredible team with one common goal: the athlete’s success. Now, let’s look at the detail necessary to dial in an athlete’s nutrition for their big race. We need to start with a good baseline of the athlete’s body composition (body fat percentage and body water percentage) as this is critical for an athlete’s success. An athlete can do a ton of training, but if their body composition is not optimized for race day, you have not set up your athlete for the best success possible. This is why each meal or snack leading to the A-race needs to have the right balance of carbohydrates, protein, and fat. 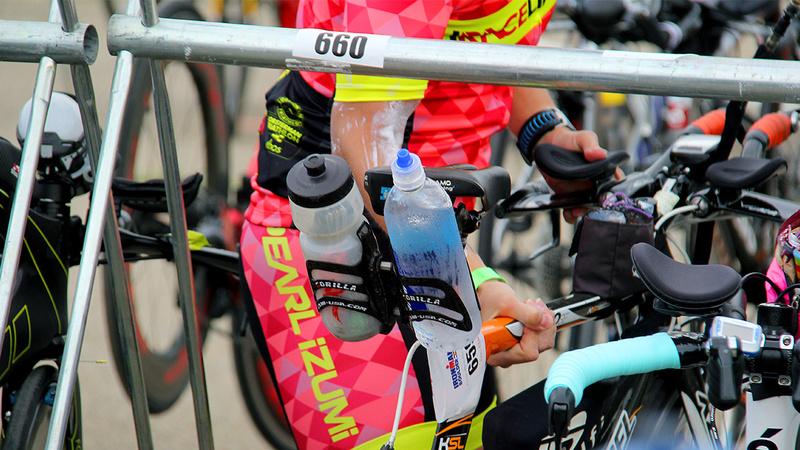 For example, on the bike, the athlete must know how many bottles of fuel to take on the bike, exactly what goes in each bottle, and how much plain water they need per hour. Then, we need to problem solve, if necessary, based on the workout data and athlete feedback. Did the athlete cramp? How many times did the athlete urinate during the workout? What was the athlete’s body composition before and after the workout? And, based on the analysis and a lot of other data, how will we need to tweak the athlete’s fueling moving forward. Now that the workout is in the books, it’s time for recovery. We need to have their post-workout fueling and hydration dialed in, too. Why? Because we need to reload their glycogen stores so they can properly recover from the day’s workout and be ready to perform optimally for tomorrow’s. As a multisport coach and nutrition coach, I’ve been very fortunate over the years to collaborate with running coaches, swimming coaches, multisport coaches, strength and conditioning coaches, and personal trainers. These coaches and trainers typically know the importance of nutrition, but nutrition coaching may not be in their wheelhouse. That’s no problem. If they are willing to outsource (those that know where to find the answer) it’s because they have their athlete’s best interest in mind. As coaches, it’s important to always have our athlete’s best interest in mind. These athletes trust us and are putting their success in our hands. In preparing your athlete for their big A-race, ask yourself, “Am I providing my athlete with all the necessary tools to succeed?” And if the answer is “no”, that’s OK; it may just be time to find someone who does have the tools.